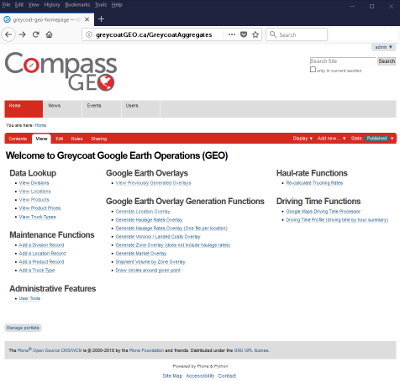 Compass GEO (Google Earth Operations) is a dynamic map based materials delivery optimization program that will lower your company's costs while increasing operational intelligence. Real time, colour coded delivery information allows operations to analyze up to the hour delivery information at a glance, and take immediate action. 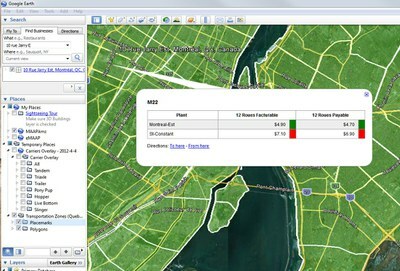 A map-based framework reduces errors in quoting, ensuring accurate cost control. Truck cycle times can be analyzed. 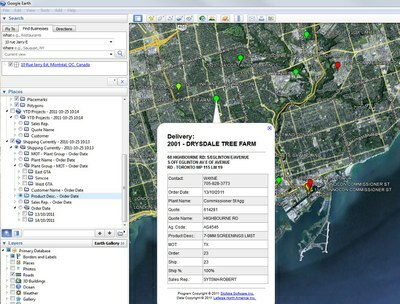 Job site routing, delivery times and real-time status information ensure reliable delivery performance to the customer. The map-based layout means full control of all activity can be maintained as the day unfolds. Colour coding helps you find problems before they find you. The user enters an address and GEO identifies the applicable haulage zone, as well as the delivery rates from various supply plants. Rates are colour coded (green, yellow, red) according to preset rate bounds. A different optimal zone overlay is created for each product. Based on supplied production costs and haulage rates, GEO is able to determine the optimal zone of delivery for each product at every supply point. When quoting a job, ensure that delivery is occurring at the least total cost. This overlay is also useful for optimizing the service area and location of a new plant. Direction ‘To here’ or ‘From here’ is directly accessible on pin’s pop-up. Location display pinpoints all company locations in the region and also competitors’ locations. ‘Google Maps’ type routing functionality is available from company locations to job site or any address. This dashboard provides an ‘up to the hour’ status display of the day’s shipping activity. The Shipping/Ticketing system produces a drop file in order to update the display. Site pins are colour-coded to highlight ahead/ behind status. A ‘Year to Date’ shipping dashboard is also provided. Selectable by type of transport. Full contact information for each carrier. 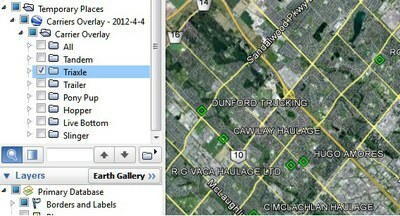 Find All Nearby Trucks A GEO overlay pinpoints all trucking companies by type of truck offered. With GEO Online you can add GEO's features to your company's toolbox without tapping the capacity of your technical team. As a subscription based service, Greycoat Software will host a private GEO installation for your company, in a secure environment.